Under W D Weir, the company turned to producing munitions and war materiel in the First World War. As well as shells, they manufactured aircraft including the Royal Aircraft Factory F.E.2 fighter and bomber. James George Weir (aviator, son of James Galloway Weir) a director of the company formed the Cierva Autogiro Company. G & J Weir would be a financial supporter of the company during its existence. In 1943, they provided the finances for the construction of the W.9, an experimental helicopter, to Air Ministry requirements. It was first listed on the London Stock Exchange in 1946. 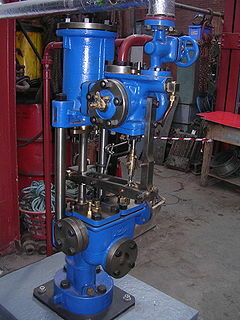 Double-acting Weir steam pumps were virtually standard fitment on British-built steamships, being used for pumping water, fuel, air and much else well into the 1950s, as well as being used on other ships worldwide. In December 1968 the Weir Group made an offer to buy the rival British pump manufacturer Worthington-Simpson, following an offer by Studebaker-Worthington. In 1969 Studebaker-Worthington acquired Worthington-Simpson. After some negotiation, Weir's acquired 50% of Worthington Simpson. A new joint-venture company named Worthington Weir was set up to handle international sales of the two parent companies. The debt taken on by Weir to acquire their share of Worthington-Simpson was denominated in Deutsche Marks, and as that currency strengthened against sterling and the dollar it became increasingly expensive to service. Worthington-Simpson was profitable, but did not cover the cost of debt. During the next decade Weir was forced to sell off many assets and undertook financial reorganization in 1981. After the financial reorganization, Derald Ruttenberg and Jacob Rothschild gained effective control of 40% of the company. Ruttenberg became a board member. In July 2005, Weir sold its desalination and water treatment businesses, (Weir Westgarth, Weir Entropie and Weir Envig) to Veolia Water Systems, part of the water division of Veolia Environnement: Weir Westgarth had been a pioneer of the multi-stage flash distillation process used predominately to produce desalinated water from seawater. In May 2007, the Company sold its Glasgow-based business Weir Pumps to Jim McColl's Clyde Blowers plc, with the pump company subsequently being renamed to Clyde Pumps Ltd.
high-pressure well service pumps and related flow control equipment to the developing shale gas industry in China. In December 2010, Weir pleaded guilty to breaching UN sanctions on Iraq between 2000 and 2002. Judge Lord Carloway of The High Court in Edinburgh fined the company £3m along with a confiscation order of £13.9m. In 2011, the company, since renamed Clyde Union Pumps, was sold to the SPX Corporation for £750 million. The business suffered heavy financial losses in the subsequent years and had to make staff redundant as the result of a long-term global downtown in the oil and gas sector. Weir Minerals - manufactures slurry handling equipment and associated spare parts for abrasive high wear applications used in mining as well as in the niche oil sands and flue gas desulphurisation markets. Products include pumps, hydro cyclones, valves, de-watering equipment and wear resistant linings. The division is present in key mining markets, including South and North America, Australia and Africa. Weir Oil & Gas - designs and manufactures pumps and ancillary equipment for global upstream and downstream oil and gas markets. Upstream operations specialise in high-pressure well service pumps and related flow control equipment along with repairs, parts and service of pressure control and rotating equipment. Downstream focuses on design and manufacture of centrifugal pumps, mainly for the refining industry. Principal operations are in North America, Europe and the Middle East. Weir Flow Control designs, manufactures and supports specialist and critical-service rotating and flow control equipment, in the main, to the global power sector. The division includes valve operations, a specialist pump business and service and aftermarket operations and is one of only a few businesses globally capable of providing specialist valves into the nuclear islands of third generation nuclear power stations. Facilities are located in Europe, North America, China, Middle East, India and South Africa. ^ a b c d "Annual Report 2018" (PDF). Weir Group. Retrieved 20 March 2019. ^ "The Auto-Gyro. English Company Formed". News. The Times (44232). London. 29 March 1926. col c, p. 21. ^ Sennett, Richard; Oram, Henry (1899). Marine Steam Engines. Sagwan Press. p. 389. ISBN 978-1297921469. ^ Weir 2008, p. 84. ^ A History of Excellence: Flowserve. ^ Weir 2008, p. 86. ^ Worthington Simpson: Grace's Guide. ^ Weir 2008, p. 110. ^ Weir 2008, p. 111. ^ Weir 2008, p. xvii. ^ Weir 2008, pp. 144-145. ^ "Hopkinsons". www.gracesguide.co.uk. Retrieved 17 July 2016. ^ "Weir Valves & Controls UK Ltd.: Private Company Information - Businessweek". www.bloomberg.com. Retrieved 17 July 2016. ^ "BBC NEWS - UK - Scotland - Glasgow and West - Former apprentice buys Weir pumps". bbc.co.uk. Retrieved 21 March 2015. ^ "Weir Group acquires American hydro firm". Added Latest acquisition. BBC. 18 November 2010. Retrieved 19 November 2010. ^ "StackPath". Global.weir. Retrieved 20 March 2019. ^ "ESCO Corporation to Join Leading Global Engineering Company Weir". Global News Wire. ^ "Weir Group fined £3m over Saddam sanctions breaches". BBC News. 15 December 2010. ^ "Businessman Jim McColl sells Clyde Union Pumps for £750m". BBC News. 25 August 2011. Retrieved 29 March 2018. ^ "Jobs go at Clyde Union as engineer posts heavy losses". The Herald. 7 November 2017. Retrieved 6 April 2018. "A History of Excellence" (PDF). Flowserve. Archived from the original (PDF) on 29 October 2013. Retrieved 23 October 2013. Weir, William (1 February 2008). History of the Weir Group. Profile Books. ISBN 978-1-86197-886-8. "Worthington Simpson". Grace's Guide. Retrieved 23 October 2013.